*If you're in Richmond, VA check out the article I wrote for Richmond.com about gluten-free friendly restaurants in Richmond. Check out the comments for even more g-free friendly places! Keep the comments and the recommendations coming! * Virginia has decided to fully embrace winter - freezing winds and all. I love the cold but have a strong hate for wind. Especially cold wind (I just typed wine. Clearly, I have my priorities in order) - it just seems to cut right through me and cause me to have perpetually frozen fingers and toes. Despite the fact that I'm pretty sure I need to invent a nose-warmer, this chill has a lovely silver lining. And that would be hot chocolate. 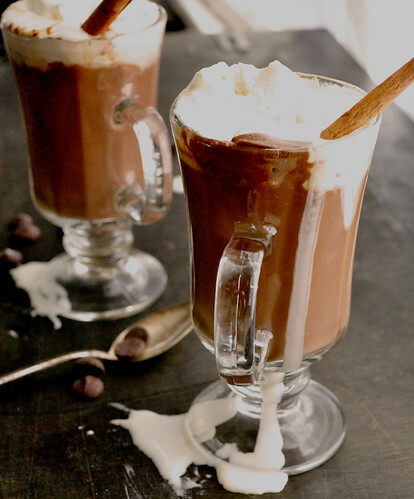 Velvety, silky, insanely rich vegan hot chocolate to be exact. 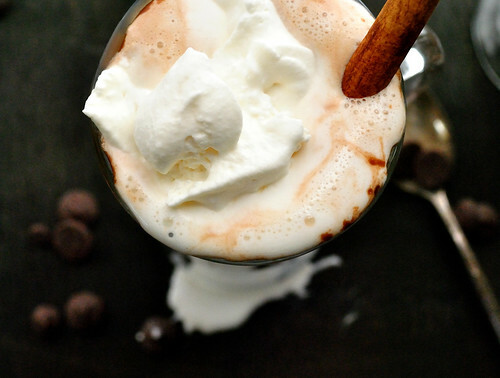 I grew up drinking the Abuelita mexican hot chocolate and quickly fell in love with the spicy + sweet chocolate combo. Rather than buy the processed stuff, I decided to make my own. I took the spicy flavors of Abuelita, added in my love for all things salty + sweet and poured it all into a mug. It is truly drinkable chocolate decadence. And if you're feeling extra sassy, add in a shot of bourbon. 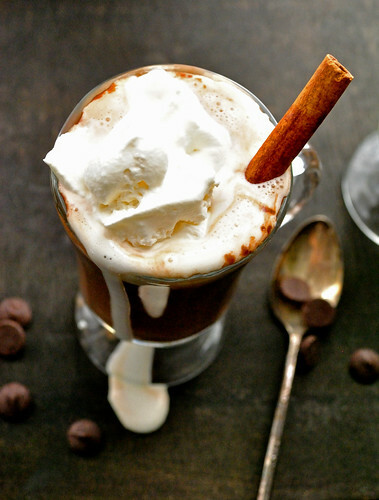 And then top it with vegan (or real, if you prefer) whipped cream so it melts into the hot chocolate. It's gonna get messy. Do it, it's only right. Full disclosure: the whipped cream in the photo is the real stuff. I stay away from milk & cream most of the time, but I just can't resist homemade whipped cream! For a full vegan version - sub your favorite vegan whipped cream. 1. Heat soy milk in a saucepan over medium-low heat until it just barely begins to steam and simmer. Stir it occasionally to keep a skin from forming. 2. Add chocolate and whisk constantly until chocolate is melted. 3. Add remaining ingredients, whisking to combine. 4. Let simmer for 2-3 minutes until the mixture is hot. 5. If you're adding booze, do it here. Shut off the heat and serve immediately. Make sure to sprinkle an extra pinch of salt on top. Yum.